Is there any smell better than the fragrance of a brand new car? It is seductive, on par with the most fragrant rose or the sweetest ice wine; it is the exhilarating aroma of a new beginning. My first memory of new car smell dates back to 1970. I was eight years old and being raised by my grandparents. One summer day, my grandfather purchased a new car: a 1970 Ford Fairlane 500. Gold-hued with a black vinyl roof, it was a welcome replacement for the dilapidated blue beater that used to occupy the driveway. It was his first new car. To be honest, that Fairlane 500 was a nondescript mass-produced Ford that didn’t stand out from any other car on the road at that time. But my grandfather loved it. More accurately, he loved the idea of owning a new car. Once I laid eyes on that Ford, I couldn’t wait to go for a ride. I jumped in and bounced up and down in the driver’s seat. My grandfather got in the passenger side and tousled my hair. “Will you get a load of that smell?” he said. It was only much later in life that I was able to fully comprehend how important the scent of newness was to him. For my grandfather, that unmistakable scent of freshly minted vinyl and plastic and synthetics represented the sweet smell of success. Growing up in poverty in Glasgow, Scotland, he’d never owned anything new. After the Second World War, he immigrated to Canada with my grandmother, seeking a new beginning. I imagine Canada in 1946 also had the smell of newness. Fast-forward to September 1985, the second time I experienced new car smell. I was 23 and working as a reporter in St. Paul, Alberta. My previous vehicles were a (used) 1974 Camaro and a (used) 1978 Civic. I was eager to become a new-car owner, and I acquired an ivory 1985 Honda CRX. I can clearly remember taking delivery of that immaculate hatchback at an Edmonton dealership. I could hardly wait to hit the open road and zoom back to St. Paul. Yet as I drove along the highway on that sunny Saturday afternoon, with Billy Idol blasting from the stereo, tears began welling in my eyes. At first, I found this incomprehensible. What was there to be sad about? Then it hit me: I hadn’t experienced the unmistakable aroma for more than a decade, and the scent of newness was triggering a flood of memories. Suddenly, I was that eight-year-old boy again sitting in the backseat of my grandfather’s Fairlane 500. We were on summer vacation, driving to New Hampshire. The backseat was strewn with Marvel comics, a box of Cherry Blossoms, and a can of Tahiti Treat. But the overwhelming scent wasn’t of newsprint or chocolate or soda. It was of newness. 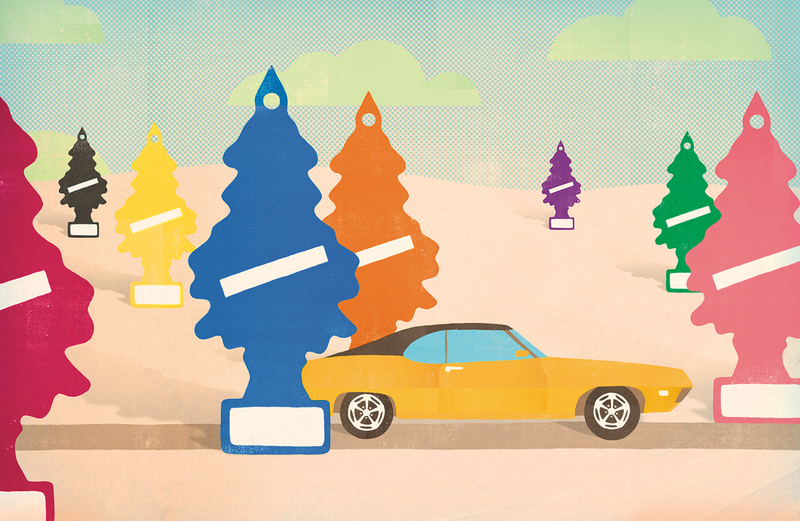 Like all good things, the new car scent of my grandfather’s Fairlane 500 did not last forever. Each week, the smell grew fainter. And my grandfather, cursed with a bad heart, was also fading away. A few years later, he died, barely four months into retirement. The scent of newness was gone; my grandfather was gone. Nevertheless, my grandfather did get a chance to experience new car smell, even if it was just once. And surely this scent—then as now—still represents the olfactory equivalent of a dream come true.